L = getLoopTransfer(T,Locations) returns the point-to-point open-loop transfer function of a control system measured at specified analysis points. The point-to-point open-loop transfer function is the open-loop response obtained by injecting signals at the specified locations and measuring the return signals at the same locations. L = getLoopTransfer(T,Locations,sign) specifies the feedback sign for calculating the open-loop response. The relationship between the closed-loop response T and the open-loop response L is T = feedback(L,1,sign). L = getLoopTransfer(T,Locations,sign,openings) specifies additional loop-opening locations to open for computing the open-loop response at Locations. T is a genss model that represents the closed-loop response of the control system from r to y. The model contains AnalysisPoint block X, which identifies the potential loop-opening location. Compute the negative-feedback open-loop transfer of the following control system model at an analysis point specified by an AnalysisPoint block, X. Create a model of the system by specifying and connecting a numeric LTI plant model G, a tunable controller C, and the AnalysisPoint block X.
T is a genss model that represents the closed-loop response of the control system from r to y. The model contains the AnalysisPoint block X that identifies the potential loop-opening location. Calculate the open-loop point-to-point loop transfer at the location X.
Compute the open-loop response of the inner loop of the following cascaded control system, with the outer loop open. Create a model of the system by specifying and connecting the numeric plant models G1 and G2, the tunable controllers C1, and the AnalysisPoint blocks X1 and X2 that mark potential loop-opening locations. Compute the negative-feedback open-loop response of the inner loop, at the location X2, with the outer loop opened at X1. By default, the loop is closed at the analysis-point location marked by the AnalysisPoint block X1. Specifying 'X1' for the openings argument causes getLoopTransfer to open the loop at X1 for the purposes of computing the requested loop transfer at X2. In this example, the negative-feedback open-loop response L(s)=G2(s)C2(s). Model of a control system, specified as a Generalized State-Space (genss) Model. Locations at which you can open loops and perform open-loop analysis are marked by AnalysisPoint blocks in T.
Analysis-point locations in the control system model at which to compute the open-loop point-to-point response, specified as a character vector or a cell array of character vectors that identify analysis-point locations in T.
Analysis-point locations are marked by AnalysisPoint blocks in T. An AnalysisPoint block can have single or multiple channels. The Location property of an AnalysisPoint block gives names to these feedback channels. The name of any channel in an AnalysisPoint block in T is a valid entry for the Locations argument to getLoopTransfer. To get a full list of available analysis points in T, use getPoints(T). getLoopTransfer computes the open-loop response you would obtain by injecting a signal at the implicit input associated with an AnalysisPoint channel, and measuring the response at the implicit output associated with the channel. These implicit inputs and outputs are arranged as follows. L is the open-loop transfer function from in to out. Feedback sign, specified as +1 or -1 The feedback sign determines the sign of the open-loop transfer function. +1 — Compute the positive-feedback loop transfer. In this case, the relationship between the closed-loop response T and the open-loop response L is T = feedback(L,1,+1). -1 — Compute the negative-feedback loop transfer. In this case, the relationship between the closed-loop response T and the open-loop response L is T = feedback(L,1). Choose a feedback sign that is consistent with the conventions of the analysis you intend to perform with the loop transfer function. For example, consider the following system, where T is the closed-loop transfer function from r to y. To compute the stability margins of this system with the margin command, which assumes negative feedback, you need to use the negative-feedback open-loop response. Therefore, you can use L = getLoopTransfer(T,'X',-1) to obtain the negative-feedback transfer function L = GC. Additional locations for opening feedback loops for computation of the open-loop response, specified as character vector or cell array of character vectors that identify analysis-point locations in T. Analysis-point locations are marked by AnalysisPoint blocks in T. Any channel name contained in the Location property of an AnalysisPoint block in T is a valid entry for openings. Use openings when you want to compute the open-loop response at one analysis-point location with other loops also open at other locations. For example, in a cascaded loop configuration, you can calculate the inner loop open-loop response with the outer loop also open. Use getPoints(T) to get a full list of available analysis-point locations in T.
Point-to-point open-loop response of the control system T measured at the analysis points specified by Locations, returned as a generalized state-space (genss) model. If Locations specifies a single analysis point, then L is a SISO genss model. In this case, L represents the response obtained by opening the loop at Locations, injecting signals and measuring the return signals at the same location. If Locations is a vector signal, or specifies multiple analysis points, then L is a MIMO genss model. In this case, L represents the open-loop MIMO response obtained by opening loops at all locations listed in Locations, injecting signals and measuring the return signals at those locations. You can use getLoopTransfer to extract open-loop responses given a generalized model of the overall control system. This is useful, for example, for validating open-loop responses of a control system that you tune with the a tuning command such as systune. 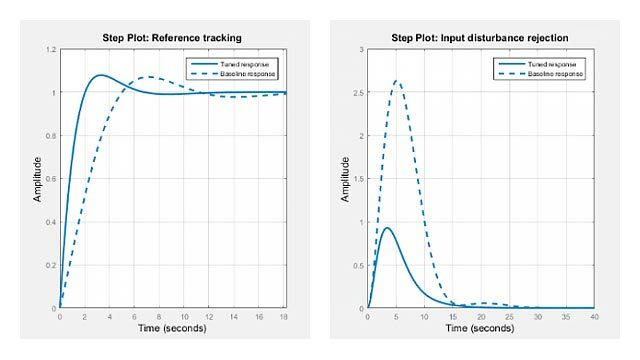 getLoopTransfer is the genss equivalent to the Simulink® Control Design™ command getLoopTransfer, which works with the slTuner and slLinearizer interfaces. Use the Simulink Control Design command when your control system is modeled in Simulink.